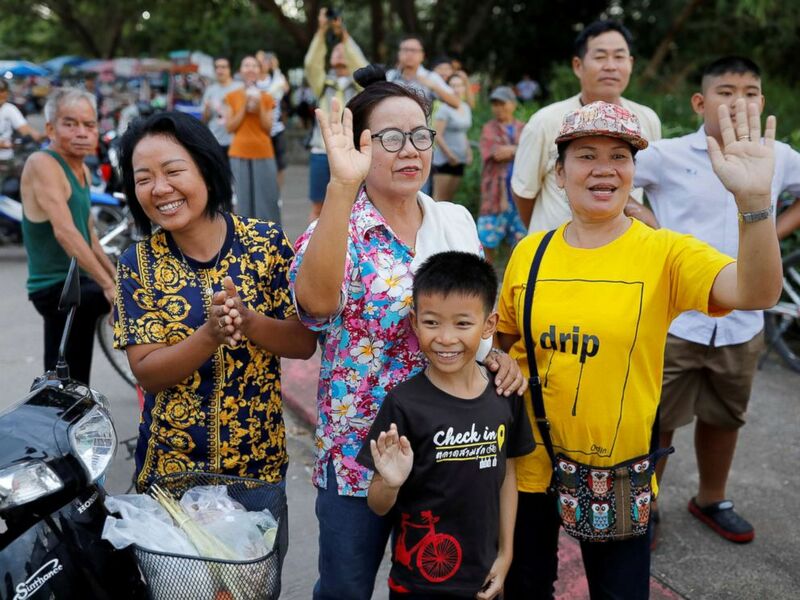 The final four boys and their soccer coach were successfully removed from a flooded cave in Thailand on Tuesday, capping a herculean international rescue effort that appeared bleak just days ago. The dramatic days-long rescue mission was accomplished around 6:30 p.m. local time Tuesday, less than nine hours after the last leg of the operation to save the wayward "Wild Boar" youth soccer team commenced, according to the Thai Navy SEALs. The announcement that the world had been waiting and praying for appeared on the Thai Navy SEALs Facebook page: "12 wild boars are out of the cave and their coach. Everyone is safe." Onlookers wave as an ambulance carrying rescued schoolboys leaves a military airport in Chiang Rai, Thailand, July 10, 2018. The SEALs later posted another message, writing, "We are not sure if this is a miracle, a science or what. All the thirteen Wild Boars are now out of the cave." The jubilant news came more than two weeks after the 25-year-old coach and his team went missing in the dark and dank Tham Luang Nang Non cave in northern Thailand. The boys ranged in age from 11-16. The massive search-and-rescue operation started in earnest on Sunday, when the first four boys were extracted from the subterranean maze. In just three days, international dive teams managed to get all 13 out of the cave as they raced against astronomical odds and a pending monsoon rainstorm that threatened to swamp the cave again. After replenishing oxygen in the cave and giving divers time to rest, the final push began at 10 a.m. local time Tuesday. As with the previous rescue efforts, 19 divers entered the cave, with two divers escorting each of the boys out of the labyrinth with tethers. "If everything goes to plan, all will come out today," an official said at a Tuesday midday press conference. Just hours later, that statement proved true when the divers emerged from the cave with the first boy about 4 p.m. local time. About two hours later, all of the others were rescued. Ambulances transport boys rescued from the cave to Chiangrai Prachanukroh Hospital on July 10, 2018 in Chiang Rai, Thailand. Former Chiang Rai Province Gov. Narongsak Osatanakorn, incident commander of the rescue operation, said Tuesday the first rescue mission took 11 hours. It took nine hours to take out the next group of boys on Monday and about the same amount of time to complete the operation on Tuesday. In addition to the coach and four boys, the doctor and three SEALs who have remained in the chamber with the boys emerged from the cave as officials were conducting a news conference on the rescues. "They are healthy," Osatanakorn said. The miraculous venture was fraught with danger and uncertainty from the start as rescuers and volunteers from around the world flocked to the mouth of the cave to brainstorm on a plan to bring the boys and coach out safely once they were located on July 2. One volunteer, an experienced diver, died in the cave from oxygen depletion as he was restocking supplies along the underwater route. 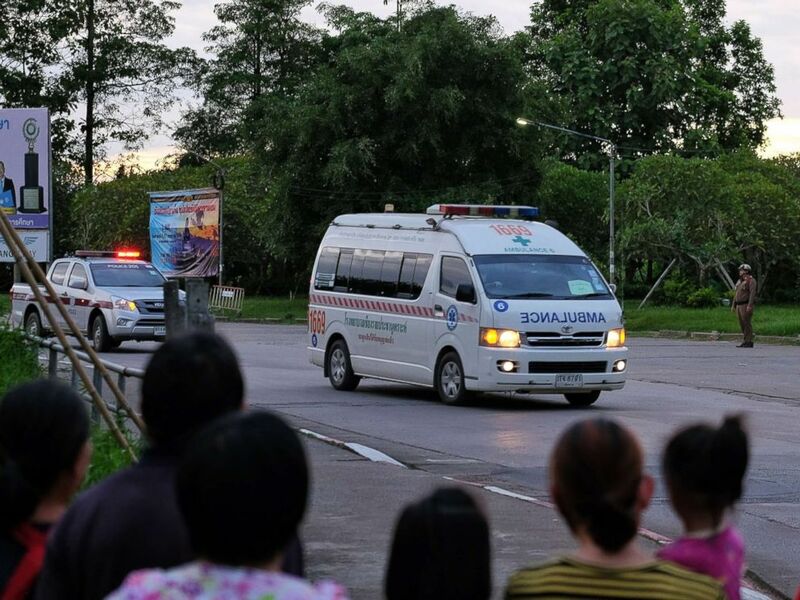 News that all of the rescues were successfully completed quickly spread to the regions, prompting many locals to gather outside the hospital in Chiang Rai to applaud and cheer as ambulances with flashing emergency lights pulled into the emergency bay with the boys. First lady Melania Trump expressed her elation over the triumphant culmination of the life-saving mission. "Wonderful to hear all 12 boys & their coach are out of the cave in #Thailand. What an amazing & heroic global effort! Wishing them all a speedy recovery," she tweeted. Officials said the first eight of the boys rescued were healthy, though two of the four brought out Monday did have swollen lungs. "They are good physically and mentally," a health official said at a separate press conference from Chiang Rai Prachanukroh Hospital. "The second four, we moved them yesterday from the cave, the age is from 12 to 14," the commission commander of the medical department said Tuesday. "[They] were alert, and able to identify themselves. When they arrived at Chiang Rai hospital there was a primary medical examination conducted on all four of them. All four are healthy." The boys' parents are able to see their kids through a glass window at the hospital. They have been temporarily cordoned off from family members over concerns of infection. 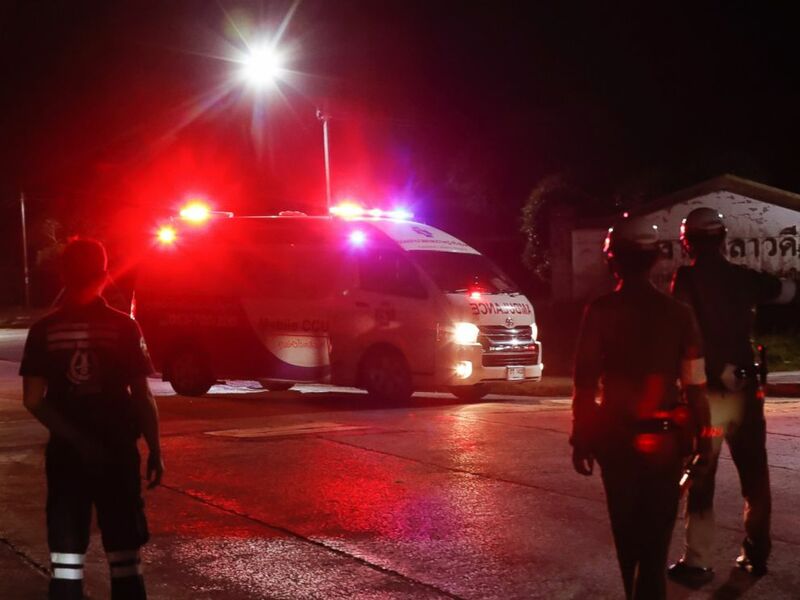 An ambulance believed to be carrying one of the rescued boys from the flooded cave heads to the hospital in Chiang Rai as divers evacuated some of the 12 boys and their coach trapped at Tham Luang cave, northern Thailand, Monday, July 9, 2018.